You may have noticed a wooden roof being built over USS Constitution‘s bow. This temporary structure, which will be removed by the end of the restoration, will shield the area from winter weather as work continues on the cutwater, hull planking, and bow bulwarks. It’s not the first time that Constitution has had a temporary roof structure built over her upper deck. Once finished, the roof will be watertight to protect the vessel and ship restorers from wind and precipitation during the frigid New England winter months. The temporary roof is being built around the bowsprit and rests on the bulwarks that surround the head area. Two hundred years ago, the “heads” on Constitution were the toilets for the sailors. A much more elaborate roof was constructed in the 2007-2010 restoration. The roof covered the whole of the spar deck, which was completely replaced during that restoration. The structure had to withstand two winters and was covered with a waterproof shield which prevented water from leaking down into the lower decks. Roof structures are not unique to the 21st century or to restoration periods. During World War II, a low house was built over the spar deck to protect Constitution during the war years when little-to-no significant maintenance could be done. Her duty during the War was to serve as a place of confinement for officers, who were maintained in the Captain’s Cabins while awaiting courts martial. The low house was removed in March of 1950. In the late 1800s, Constitution was fitted with a “barn” to turn her into a receiving ship, a place where enlisted sailors would receive their new orders. The watercolor shown below, painted by Hendricks A. Hallett of Charlestown, Massachusetts in the late 19th century, depicts Constitution with her barn at the Portsmouth Naval Shipyard in Kittery, Maine. 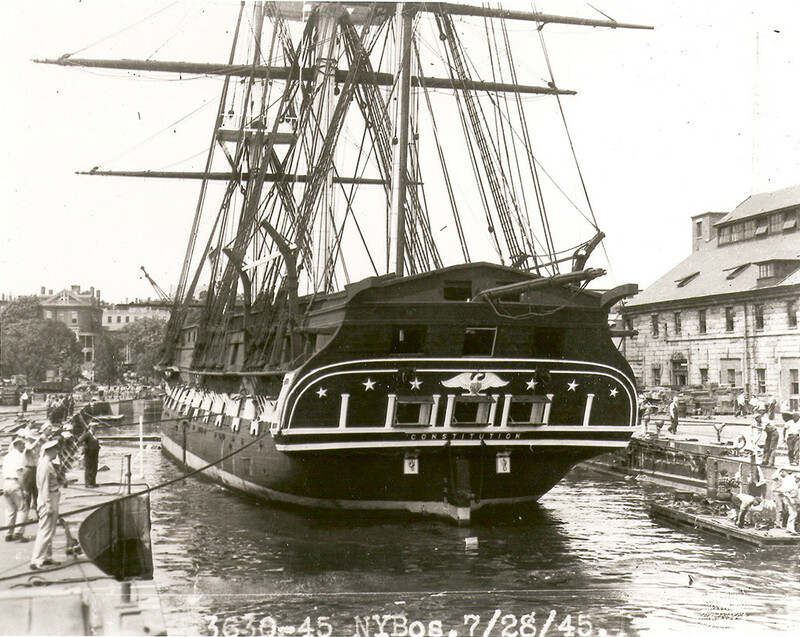 This view of “Old Ironsides” against the backdrop of the enormous ship houses at the Portsmouth Yard was frequently painted by local and regional artists. As can be seen in the plans below, the receiving ship barn was intended to be a long-term modification to Constitution. The complex two-story structure included upper-story windows, a catwalk across the roof, and rooms and offices built into the superstructure above the stern. Construction was probably completed by the summer of 1883. Despite the significant change in appearance, Constitution was still recognized as a national symbol. And as such, on a couple of occasions while at the Portsmouth Naval Shipyard, patriotic associations held commemorative gatherings on her decks. When we look back across the centuries, the U.S. Navy has employed a variety of ways to preserve Constitution. Houses or barns, while not the most attractive coverings, have sufficiently served their purpose. The small house on the bow during the current restoration is one in a long line of temporary or semi-permanent roofs that have extended the life of America’s Ship of State.